Did you know that the average college graduate earns $800,000 more than the average high school graduate by the time of retirement? But right now, going to college may not feel like a financial win when you’re figuring out how to pay your tuition. But we have some good news for Maine residents: there are plenty of resources out there to help you fund your education. In fact, the New England Board of Higher Education (NEBHE) and the Financial Authority of Maine (FAME) offer many opportunities to students just like you. In addition to the state, the U.S. government and hundreds of private organizations reward students with financial assistance every year. Below, we've laid out four steps you need to take to help you maneuver through the process. We believe you deserve the opportunity to go to college without going into extreme debt. The key is great planning! The first step in applying for financial assistance is the same for every American: filling out the Free Application for Federal Student Aid (FAFSA). We won’t lie, the FAFSA can be overwhelming. The good news is, we made a guide to help you through each step. Completing the FAFSA is well with your time. The federal government has an annual budget of over $120 billion to give out to motivated students, and you could easily be one of them!! It’s important that you stay on top of the FAFSA because many of its offerings are awarded on a first-come, first-serve basis. If you’re not sure where you’ll be accepted or where you want to go to college, that’s okay! You don’t need to have any plans solidified to submit the FAFSA. So find a time to sit down and get it out of the way sooner rather than later. The FAFSA ensures you’re considered for some state-specific aid, but there are many other unique opportunities available to Mainers like you. Some may require additional applications. Richard H. Pierce Memorial Scholarship for student leaders who wouldn’t have the opportunity to attend college without financial assistance. Doctors for Maine’s Future Scholarship for students enrolled in a qualifying Maine-based medical school program. Malaga 1912 Scholarship Fund is a highly specialized award for descendants of those forced from Malaga Island in 1912. State of Maine Grant Program for the most financially-needy students attending eligible in-state colleges and universities. Maine also offers several forgivable loan programs. Unlike traditional loans, forgivable loans can be absolved. Their terms and conditions may ask you to do certain things in return, however, so be sure to understand what’s expected of you before accepting one. Educators for Maine Program for future educators committed to teaching in Maine schools. Maine Dental Education Loan Program for those studying dentistry who agree to work in an underserved part of Maine. Maine Veterinary Medicine Loan Program for Maine residents interested in the veterinary field. The state of Maine offers tuition waivers for eligible applicants who spent time in foster care, as well as children and spouses of public servants killed in the line of duty. The New England Board of Higher Education (NEBHE) offers tuition breaks to some Maine students through its Regional Student Program (RSP). Through the RSP, Maine residents can get discounts on out-of-state tuition at state colleges and universities in Connecticut, Massachusetts, New Hampshire, Rhode Island, and Vermont. Some scholarships don’t come directly from the state or federal government. Check your high school guidance office weekly to learn about scholarships offered through local organizations like your rotary club. You can also look here for a list of Maine scholarships offered by region. Most colleges and universities offer their own scholarships to students, too. Be sure to explore the scholarship page for your school of choice. For example, you can take a look at the University of Maine’s scholarships. And look with a careful eye! You don’t want to miss anything special like the Maine Match Program, which sometimes matches the net cost of attendance at other New England schools like University of Massachusetts, University of New Hampshire, University of Connecticut, University of Vermont, and University of Rhode Island. Sometimes you have to dig to find the most precious hidden gems. Click here to explore opportunities available uniquely to community college students. Non-traditional schools often offer scholarships, as well. Click here to view opportunities through the Maine Maritime Academy. You might be shocked by the amount of scholarships out there. Be sure to do some searching on your own through any number of online search engines. For example, Scholarships.com lets you search by a number of different characteristics. You can click here to see what they have listed just for Maine students. If you’ve applied to all of the scholarships and grants you’d like and you could use some more financial assistance, that’s okay! You can apply for a private student loan. 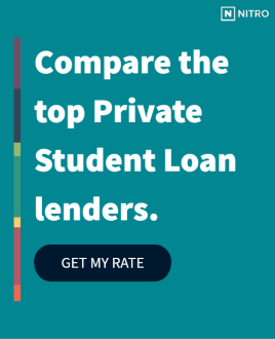 Click here to see a list of the Best Banks for Private Student Loans. It may feel daunting applying for loans, which—unlike scholarships and grants—must be paid back over time. We want to help you understand what that commitment looks like. Play around with our free NitroScore tool to see how easy it will be for you to pay back loans after graduating. The tool will calculate a score using your total costs, potential loans needed, and projected post-graduation salary. As a resident of Maine, you have special opportunities to receive loan-repayment assistance. Check out Opportunity Maine for more information on potential tax credits on loans. Click here to read more about the Alfond Leaders program, which specifically serves Mainers in the STEM field. Applying for financial aid is a process that—quite literally—often pays off. You've got this!